The Ukrainian ombudsperson demands access to the film director. Ukrainian ombudsperson Lyudmyla Denisova has asked the director of the Russian Federal Penitentiary Service to allow her to visit Ukrainian political prisoner Oleh Sentsov, who has been on hunger strike. She said on Facebook that she talked to Sentsov's lawyer Dmitriy Dinze. "Dmitriy visited Oleh today again. He says that Oleh is very pale, hardly moving or getting out of bed. Doctors say his sensors are failing. The second crisis (the first one happened on the 26th day of his hunger strike) can happen any moment. The lawyer believes that once this happens, he will immediately start force-feeding him," she said. Therefore, she demanded that Russia give her urgent access to Sentsov. In 2015, Russia sentenced Sentsov to 20 years in colony on terrorism charges. He was accused of setting up a group in Crimea which had carried out two assaults and was plotting another two. Another suspect in the case, Oleksandr Kolchenko, was sentenced to 10 years in colony. On 14 May, Sentsov declared an indefinite hunger strike, demanding a release of all Ukrainian political prisoners held in Russia. 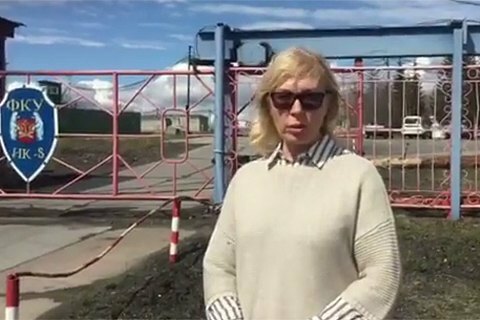 On 15 June, Denisova came to Sentsov's colony but was not given access. Russian ombudsperson Tatyana Moskalkova insisted that Sentsov gained weight and said his hunger strike was a "diet". Sentsov's lawyer said recently that the film director was having heart and kidney problems.